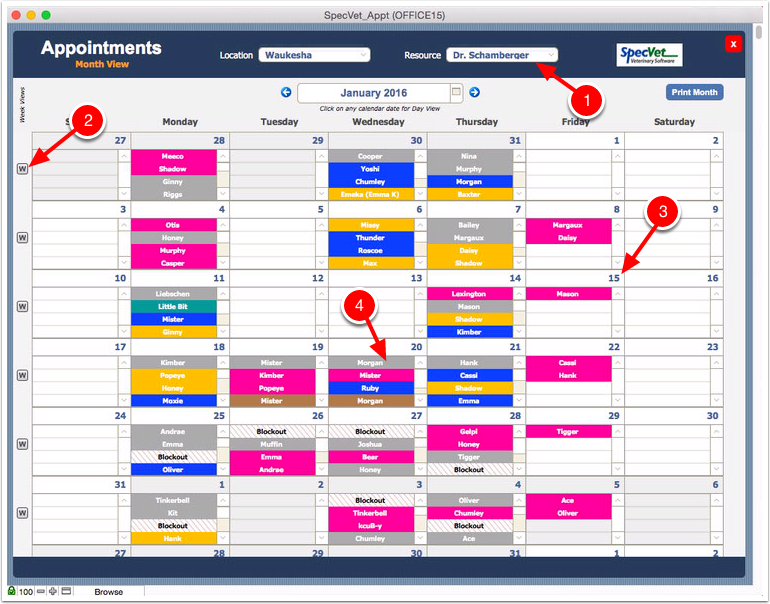 To access the Appointment Module, from the Home Screen, click the Appointments tile. Currently selected site. Click to change. Currently selected date. Click the calendar icon on the right to select, or click the buttons to the left or right to advance or retard by one day, week, month or year. The Today button navigates to the current date. Resource column. This could be a provider or resource such as an MRI machine. Column scrollers. These buttons move the columns up/down or right/left. Availability slot. 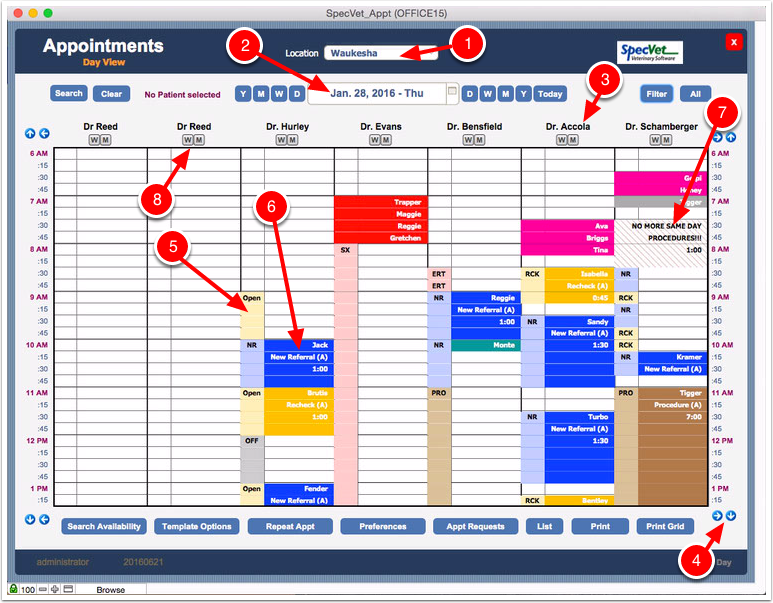 This shows the appointment Availability for a resource. Clicking in this column allows editing or creation of Availability. Blockout. This shows a time when the resource is not Available for appointments. Clicking on the Blockout allow for editing or creates a new one. View selectors. These buttons change to the Week and Month views for the selected resource. To create a new Availability or Blockout, click in an empty slot in the Availability column. 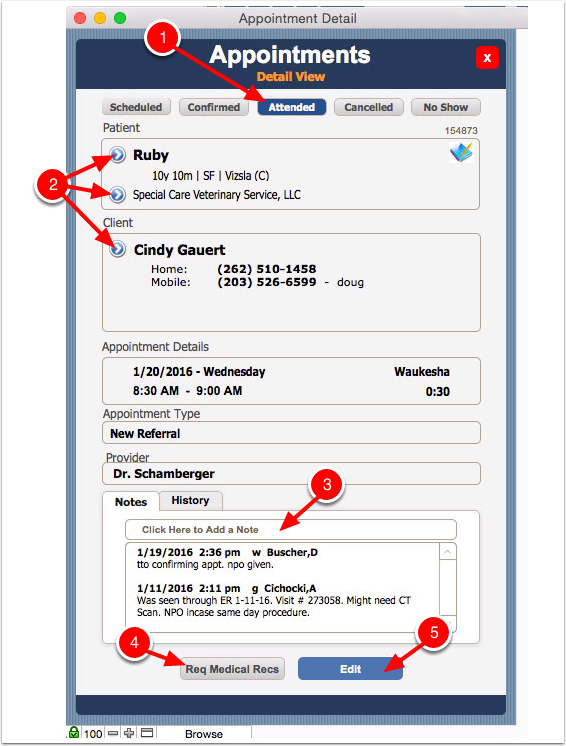 To create a new Appointment, click in an empty Appointment slot. Resource selector. This shows the resource that is currently being viewed. The resource can be changed by clicking here and selecting a different resource. View selectors. These buttons change to the Day view or the Month views for the selected resource. Other features of the Week View are similar to the Day view. Week View button. Click here to switch to the Week View for the currently selected resource. Day View button (Date Number). Click here to switch to the Day View. Appointment button. Clicking here shows the appointment Detail View and allows editing. Other features of the Month View are similar to the Day and Week views. Appointment Status Buttons. These buttons show the status of the appointment. The highlighted button is the current status. Click on a button to change the status. Related Record Navigation buttons. 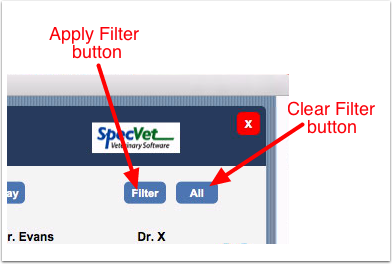 Click these buttons to open the related Patient, Client and RDVM records. Note Entry field. Type notes into this field. Notes are automatically added with the enter key. Medical Records Request button. Click this button to print a Medical Records Request form. Edit button. Clicking here changes to the detail Edit View (see below). When changing the status of an appointment to Cancelled, the appointent wil be removed from the Day, Week, and Month Views so another appointment may be scheduled in its place. If the Cancelled button is pressed in error, you must enter the Edit View to change it to a different status. Delete button. Click to permanently delete the appointment. Revert button. Click to ignore any changes. Save button. Click to save changes. It is not possible to change the Patient for an appointment. If the patient is incorrect, Cancel the appointment and create a new one for the correct patient. 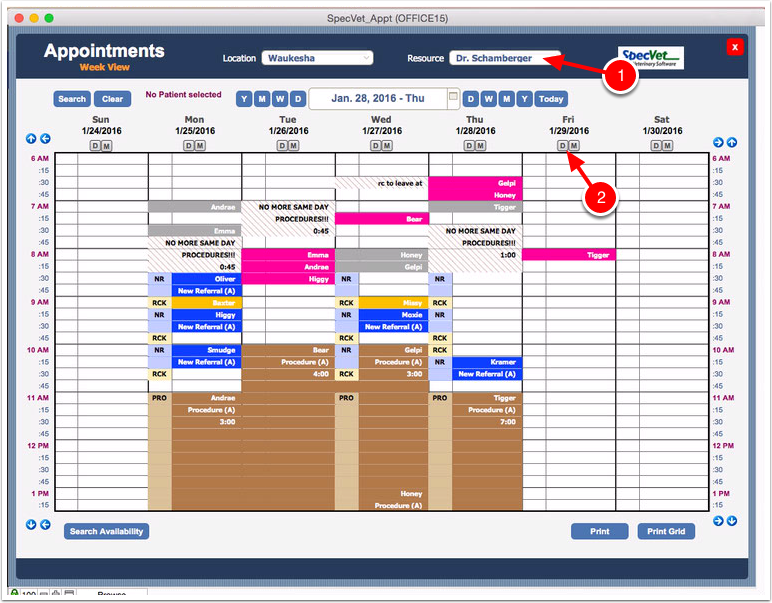 When creating a new appointment, you must first select a patient. 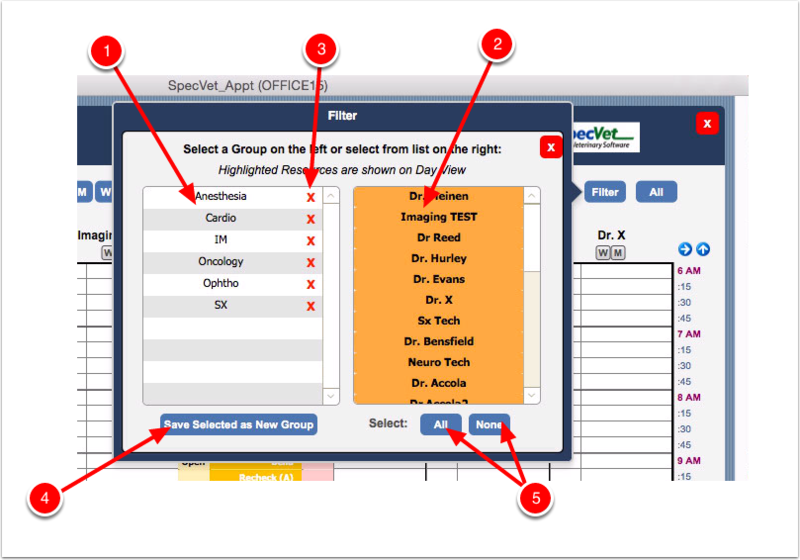 Use the Search button to select a patient. The selection window will open. Enter the search criteria for the Patient. 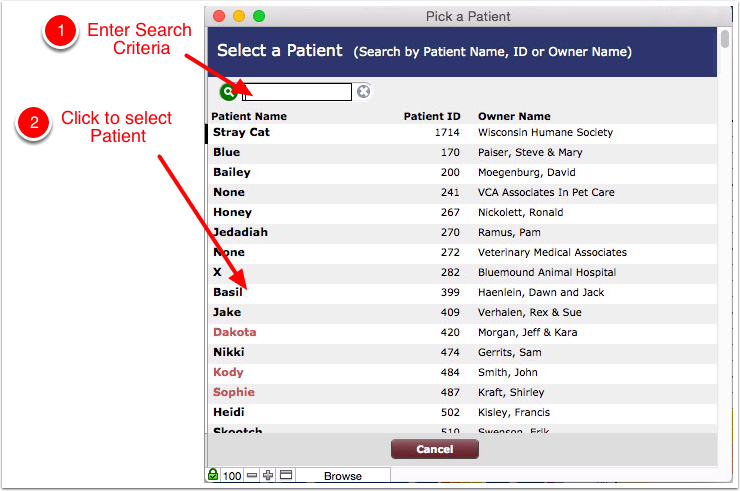 You can search by Patient Name, Client Name, or Patient ID. Then click the Patient you wish to create the appointment for. 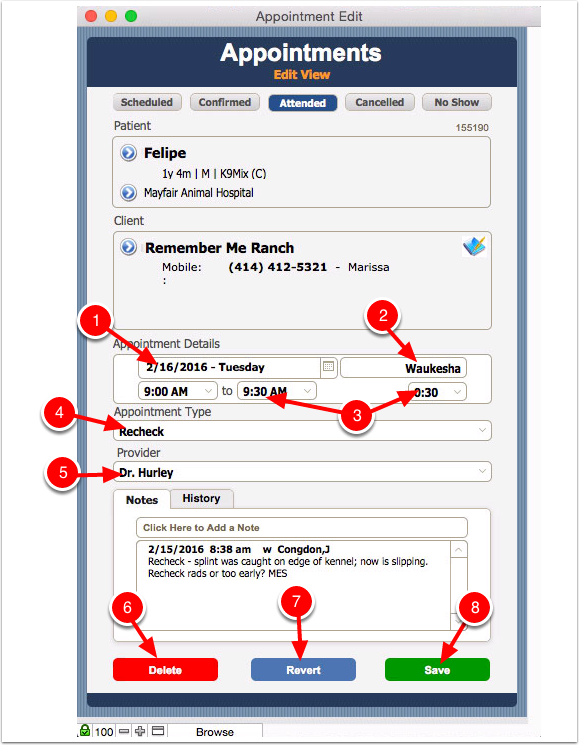 After you have selected a Patient, the Patient info will be displayed on the calendar view. 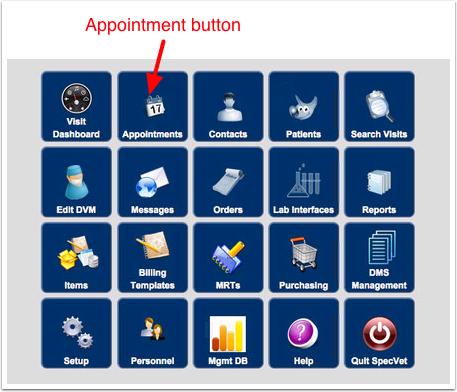 It is also possible to select a Patient while creating a new appointment from the Appts tab of the Patient record. On the Day View, it is possible to filter the columns by specific Resources. To apply or create a new Filter, click the Filter button on the upper right side of the Day View layout. To clear the currently applied filter, click the All button. Resource selections buttons - to select all or no resources - Selected resources appear with a yellow-orange highlight. Click on the filter name in the left hand column. Verify that the filter has been applied. The filter name will appear under the filter selection buttons on the Day view layout. Close the popover with the close box. 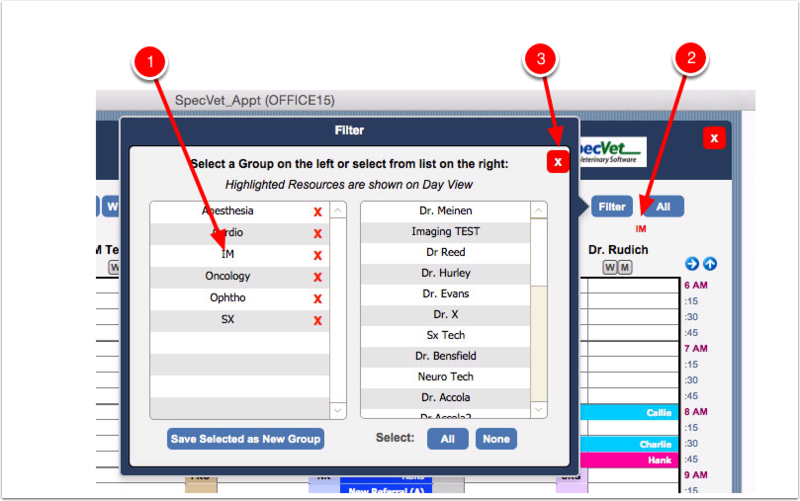 Select the Resources for the filter by clicking on the resource names in the right hand column. Highlighted resources will be included in the filter. After all resources have been selected, click the Save Selected as New Group button. 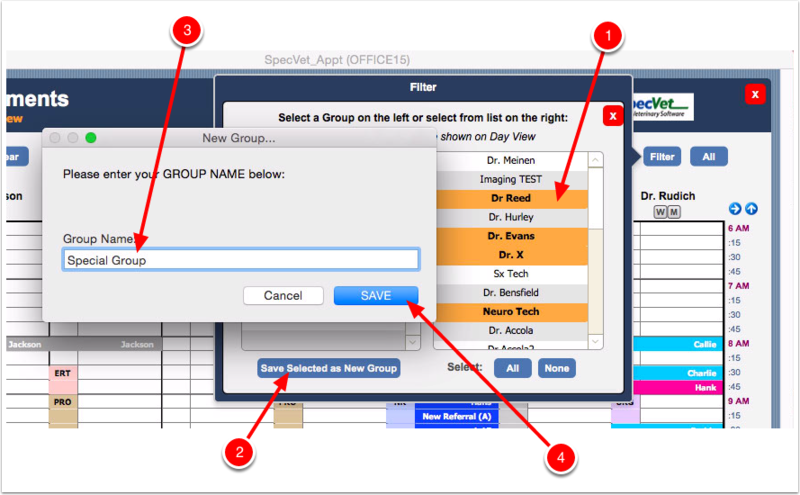 Enter the the name of the filter (Group Name) in the dialog box.